That last desire is one of the dominant themes of the book. The quest for spiritual enlightenment relies upon many strands, say the authors. The best foundation is self-awareness, and from that one builds towards the pinnacle of spiritual well-being through improvements in diet, stress management and physical activity. This builds upon a classic hierarchy of needs as described by Maslow. Yoga and similar disciplines can play a large part towards the top of this hierarchy, as well as meditation techniques. Many of the philosophical anecdotes sprinkled through the initial stages of the book allude to adepts seeking wisdom from spiritual Masters on how to attain enlightenment. Other anecdotes are more personal stories shared by the authors to illustrate their discussion points, which help to lend the narrative a sense of shared experience. In my own case as a 'helper', my shadow side would be ingratiation, or an over-tendency to flatter other people. This is certainly a fault of mine and comes out almost like a reflex response in certain situations, which I need to work on. So, I'd better not flatter the authors too much on this book, then! 'Sustainable Wellness' contains long lists of questions to probe our natures and behaviours, and advocates writing down pretty much everything. I'm not sure a self-reflective process requires this much diary-keeping... except perhaps in the case of dieting and raising one's awareness of what food (or pretend-food) one is ingesting. The section of the book on nutrition is really good. The authors break certain food-stuffs down for us in terms of their glycemic index and load (p124). Given that something like 80% of food offered in American supermarkets contains sugar, we all need more of this kind of awareness-building. The authors then explore the problems processed food creates, particularly to do with inflammatory disease. I guess most people recognise these issues, but are they sufficiently motivated to change ingrained habits? This is one of the main challenges this books confronts. 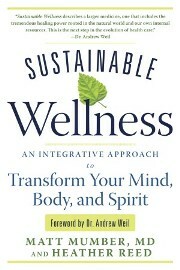 The practical side of the book continues with a very helpful section on exercise, and another on stress management. Again, our sedentary lives, combined with the comfort-eating used to counter-balance stress, are central features of the deteriorating picture of health in Western societies. The healthiest generation was the war generation, I think - they had plenty of stress to contend with, but stacks of exercise compared to us, and a comparatively healthy, if austere diet. We have a lot to learn from them. "Eat less, exercise more" is the modern refrain for those tackling obesity - the war generation had no choice, whereas we do and, given human nature, that's largely our problem. So, I think this book went some of the way towards this, but could have been more scathing of our modern lifestyles and the food industry in particular. It also could have tackled smoking which, quite frankly, is the number one health issue on any doctor's list of dos and don'ts. Another area for attention would have been sexual health. These aspects of our lives can have a considerable impact on our well-being, particularly in terms of sustainable health in the long-term. The gaps these health issues left were filled in the book by plenty of discussions about yoga, meditation and spiritual guidance, including a look at the various stages of spiritual growth. There's a whole section on how to hold group sessions, and plenty of lists to help you to structure your ascendance to the next level. All in all, the book felt like a supportive chat with a well-meaning friend. No self-help book can really reflect back the personal issues that an individual reader brings to it, although the authors did point the reader in the direction of the resources available to supply that feedback and personalised support. The balance of the content steered too much towards spiritual growth to my own tastes, but the well-meaning mission of the authors shines through.